Bringing home a new puppy can be joyful but also challenging. There are so many things to consider. Where will the puppy sleep, where will they spend most of their time, what toys do they need? The list of questions is endless. The challenge is magnified if your puppy has diarrhea. Puppies can have diarrhea for a variety of reasons. Sometimes just being taken from the litter and put into a new home can be stressful enough to trigger puppy diarrhea. In this case the symptoms may disappear after only a day or two without any intervention on your part. 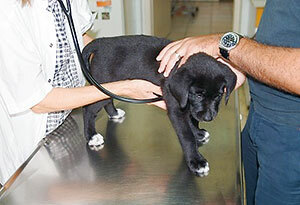 However, if the puppy diarrhea persists, action needs to be taken to keep the puppy from becoming dangerously ill. Diarrhea can dehydrate a puppy and can become a big problem if not dealt with quickly. Be particularly aggressive if the puppy isn’t eating or drinking normal amounts of food and water. Sometimes a puppy will develop diarrhea due to a food change. Perhaps the breeder used a food that’s different than what you feed the dog. This change can adversely affect a puppies’ young digestive system. Usually the diarrhea will disappear after a day or two, once the puppy gets used to the new food. 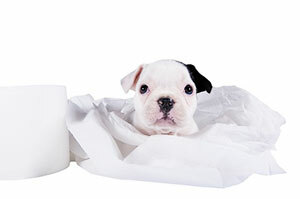 Many breeders will give the puppy a shot of anti-diarrhea medicine when they send them to their new home, just in case. But if your puppy has diarrhea there are some things you can do to help them get through it naturally. Give the pup a small bowl of plain yogurt once a day. The live cultures in the yogurt help the puppies’ digestive system and can clear up the diarrhea. Puppies seem to love yogurt but if they don’t eat it, add some flavor, like a ground up puppy treat. Another thing to check is whether or not your puppy food has any soybean products in it. Some puppies’ digestive systems don’t deal well with soy. Switch foods and the diarrhea may disappear. This simple cure has helped me on more than one occasion. If the puppy diarrhea doesn’t go away after 2 or 3 days, it’s time to take the pup to the Veterinarian. Usually the Veterinarian will want a sample of the diarrhea. They will analyze it, looking for any kind of virus or bug that may need to be dealt with. If nothing adverse is found the Veterinarian will probably give the puppy some anti-diarrhea medicine, which should clear things up. If there is a virus involved, a course of anti-biotic may be indicated. It is rare that any surgeries are required. Having a new puppy or dog is challenging enough without complicating things with uncontrollable diarrhea. Dealing with this problem head on, will make your early days with your new companion much more pleasant, and may even save you from having to replace your carpet. I brought a puppy home from the breeder years ago with diarrhea and tried everything including diarrhea medicine and pumpkin etc… but I switched foods to a food that has four different types of lactobacillus in it and with her first bowl she had perfect stool. I don’t see what the brand is. Can you give it to me? I never heard of such a dog food. I have a new puppy with the diarrhea. I am feeding her only the same puppy food as the breeder, but her stools are still very loose. Perhaps the food is Innova? I find the yogurt works wonders with my puppies. Make sure they don’t have worms, Giardia Or Coccidia…. Cheryl’s reluctance to provide the name of the food she uses makes me question her love or concern for puppies that she doesn’t sell. I had seen this post. I had read that Cheryl had given her puppies a kind of food with lactobacillus. It doesn’t matter what brand of food she got what soever cause.. Lactobacillus is a type of accidolphilis, so if you take accidolphilis and ground it up and put in puppy food that is good for the good bacteria in the body. This is just a point. Antibiotics are not given for a virus, only for a bacterial infection. The article is incorrect. Any good breeder will send you home with enough food to change the pup over if they are going to change. And I’d like to see a mention of the possibility of Parvo here! if there is vomiting along with diarrhea, it’s a strong possibility. And Parvo is mutating at a fantastic rate. Some reports say that there is not always vomiting, in fact, a rescue here last year had neither, and a negative test x2 before she tested positive. I tell my clients that if their pup has diarrhea for more than 24 hours, insist that the vet test for Parvo, and if the test is negative, and diarrhea continues for a 2nd 24, insist that they treat the pup as if it has Parvo. This is nothing to fool around with.